Mandy Aftel has been at the heart of the natural fragrance movement for nearly twenty years. After a brief period of creating natural perfumes for luxury giants Bergdorf Goodman and Neiman Marcus, she released her book Essence and Alchemy, which officially launched the movement, revealing the creative and aesthetic possibilities of working with natural essences in perfumery. She owns and operates Aftelier Perfumes, one of the most sought after natural perfume ateliers in the industry, and recently released her latest book, Fragrant: The Secret Life of Scent. AS: Could you speak a little about how you found your way into working with perfume? MA: Well, I’ve never really been a person who’s had much of a plan in their life– I’ve literally kind of followed my nose! I love doing research and am an avid reader, a going to the source kind of person. I had a career for a long time working as a psychotherapist for creative people, for artists and musicians. I also wrote books– the last one I wrote in that field was called The Story of Your Life, and the first book I wrote was about a rock star, so I kind of look like I’ve been all over the map. I've done a lot of research on plot and story, and realized while being a therapist that people were really telling me stories, and so I decided I would write a novel. For some reason I chose to make my main character a perfumer, and felt that would give me the opportunity to do a lot of research. Although I knew the field of perfumery worked mostly with synthetic materials, I was interested in learning more about the natural ingredients of perfume that came from all over the world, and had special connections to different cultures and ethnicities. I began to collect old perfumery books (this is before the internet), and started to fall absolutely in love with them. Their old woodcut pictures, the lore and the stories surrounding them were fascinating to me. My friend and I took a class on essential oils, and experimented making perfumes. During this process I had the experience of feeling that I just inherently understood the essences –not necessarily like I do now– but there was something that really resonated intuitively with me when I began to work with them. Eventually my friend and I started the first natural perfume company, which was sold in Bergdorf Goodman and Neiman Marcus. Unfortunately this arrangement did not end well, and I decided to stop making perfume. Then the editor with whom I had been working on the novel with suggested I write an informative book on natural perfumery. This book became Essence and Alchemy, which has been published all over the world in ten languages, and has developed its own following. After the publication of the book, I had over two hundred turn of the century perfume books in my collection, and was obsessed, and just in love. I began to start making perfumes again, but decided that I would only do custom perfumes, one of a kind perfume portraits for people. But one thing again led to another, and it grew into a small, all natural artisanal perfume business. This time I kept it strictly small and to what I could create myself. I am a maker and enjoy running my business entirely myself. I don't sell in stores, but the internet and selling online has been a blessing for me. So that is a very short story of how to got to be where I am. It is inspiring to hear that through your experiences you found a way to become a very successful perfumer while honoring what you love about your craft. It sounds like having this kind of integrity is very important to you. Yes, I’ve had a lot of opportunities from all over the world, stores have all come after me, but I’m very lucky in a way because I’m not interested. I do exactly what I love. Perhaps other people have different aspirations for what they want, but I feel so lucky doing it in the way that I am, I just can’t believe it. You identify yourself as a natural perfumer versus someone who works with synthetics. Would you please explain the difference between natural and synthetic fragrances? I work only with natural essences, which are ones that are botanical. They are not made from petrochemicals or coal tar, or other synthetic ingredients. 99.9% of all perfumes out there are from synthetic ingredients, meaning they do not come from nature. This can prove to be a problem if you are out looking for natural perfumes, because everyone says their ingredients are ‘natural’, that they are botanically derived, and so on. So if you are looking for natural perfumes at a department store, or even a luxury store, they will say their perfumes come from natural sources, but they usually don't. The larger world of perfume is mainly about commerce, it's a very profitable item. But the beauty of the naturals, the aesthetics and the aspects of it that I work with are in the minority. So it can be challenging for the consumer to figure out the truth of what's going on. Usually with natural fragrances there are a few things that are true about them– they are expensive, they come in smaller bottles, and they don't last very long. So if you put something on in the morning and you want it to be there at dinner time, or even at lunch or a couple hours later, if it's still there what’s making it last is the presence of synthetic chemicals. I have always compared natural and synthetic aromas to a baguette versus wonder bread–wonder bread stays soft and can be used for a really long time, but with a baguette you have a day or two and then it begins to resemble something like a baseball bat. So it has to do with that whole natural arc of materials. Natural essences also interact with your body chemistry in a different way, they are highly colorized... so there are ways in which you can tell the difference. Yes, I co–authored a book with a two star michelin chef, a very talented man named Daniel Patterson. In it we explored the pairing of essential oils and foods, and in result of that I now offer chef's essences, which can be used to enhance flavor, which have a very long history as an important use of essential oils. In fact this history followed a path very similar to that of fragrance, where in the 20th century they moved on to synthetics. So yes I became very interested because I feel like the commitment to ingredients and quality has vey much moved into the front of people’s minds in food. I have a natural affinity to chefs, mixologists, bakers, chocolate makers and so on, and I am very interested in those artisanal processes. With the emergence of both the natural food and fragrance movements, a lot of information has sprung up on the internet– websites where fragrances are sold, catalogued and reviewed, and it can appear quite daunting to someone who might be starting to explore the world of natural perfumery on their own. Are there any recommendations you could give someone as far as a compass for where to begin? You know I can’t believe what has sprung up from Essence and Alchemy, and I would really be daunted with all that is out there now too– there’s a whole world of people teaching, making, and reviewing perfume, and there's a lot of interest in it, which is very exciting. I give some instructions for that in my book, but going on the internet is always kind of complicated in terms of how to find your way, and what you should be looking for. There are many bloggers that do a wonderful job reviewing things, but I think the main thing is to inform yourself by reading a book, educating your nose, and picking and choosing what really sounds right for you. I think food is a great way to enhance your sense of smell, actually. Bringing your consciousness to smell the cantaloupe, smell the tea, to use your sense of smell to take a moment and be aware of what you are cooking, you discover that cooking, eating and shopping are incredibly aromatic experiences. The more you begin to pay attention to smell and discover the pleasure it can bring you in life, the more you will learn about it. Smells are complicated, and they take you places, and remind you of things, and just allowing them to wash over you will start you on a path. Going into your garden or a farmers market and finding some mint leaves, ripping them up and just smelling one, is a very pleasurable experience. It puts you in touch with things in the here and now, and also feelings and memories from the past. This way of experiencing smell is something immediate and very easy to do. I have a very vivid memory of the first time I was in a shop where I could sample and smell a lot of different natural essential oils– I remember walking out afterwards feeling as if my nose had grown, had opened up to this completely different state. I was more relaxed, I felt healed in a way, and I thought of this experience while reading in your book Fragrant how you speak of wanting to give people a ‘new nose’. Yes I love that idea, there is this marvelous philosopher named Michael Serres, who spoke of the experience of tasting a very fine vintage wine that opened up the possibilities of taste to him, giving him a ‘new mouth’. The concept is the same, I love the philosophy that I found, and his aesthetics speak very directly to making perfume. You mention in Fragrant that smell can be a doorway into the imagination and dreams, and much like music it can open a pathway into the less tangible parts of our experience. Do you find when you are making your perfumes you often have particular visions or feelings of what you are creating, or does it vary depending on the kind of perfume and materials you are working with? Well I love the idea that language and smell are not so close together in the brain, and you can't find words so quickly to describe your experience of smell, or often they do not feel quite right in the beginning. I love all of that, because it can't be tied down, so it's more expressive and more de–languaged. So honestly when I am creating and working with scent, I am usually high the whole time– I feel it has such a profound effect on how I feel and where I go, it just makes me very happy. I can remember a sad time in my life when something very painful happened to me, and I would start working and halfway through I would be very happy–some of that was of course doing creative work and all the good things that come from that, but part of it was that it had this wonderful effect on my imagination and my brain. Often people will say to me ‘I am this kind of person, what kind of perfume would I like?’ or a magazine will call me up and say 'this woman is sporty, and has two kids, what would you recommend for her?' and I tell them I am not the right person for this, because for me, it's the oils that have the personalities. And so as you gravitate towards difference essences, I learn different things about you, which is one of the things I love in my custom perfume making process. So for me, the essences are very alive, and they all have different personalities– jasmine is different than rose, oak moss is different than sandalwood, they have these capacities and these worlds inside them. And working with these worlds, they come together and can be experienced very much like music– they are called notes, you put them together, they make chords.. and how they effect each other, what happens to the notes one after another as they unfold in time, is what makes for a perfume. So I’m in this delicious, very beautiful state while I'm working, and it doesn't very much feel like work. I mean I do revise, it's not like I just plunk it all in a bottle and that's that. But I get so much from being able to experience such unadorned beauty, and that's why I love the natural essences. So I think there’s a lot of things that go along with the process, but for me I really work with the natural materials because they are so drop dead gorgeous. I found it fascinating to read in Essence and Alchemy how in the old world the chemistry, aesthetics and healing properties of perfumery were all practiced in a unified state, and aimed to capture a complete experience. Do you feel your work is inspired in a similar way? Yes, when I create perfumes I always have two things happening. One is a conversation between two ingredients –which may not be obvious to anyone but me– but I usually choose two essences that I may be interested in and explore their relationship to one another, how they are going to effect one another, and what is going on between them in my mind. The other is to capture an emotional experience. For me this part is as if I were a musician or a composer and am making music, or am painting, and I want that experience to be in that bottle. So when I am watching who likes what scent, or what they are responding to, no matter how people may or may not think my perfumes smell, they capture something about life, and thats really what it's about for me. That's very beautiful, this idea of relationships, because as the creative process is often something that can't really be pinned down in concrete terms, working with relationships can become an important reference point when you are creating and there is more of an emotional intelligence at work. Oh yes, absolutely. There is one person I mention in Essence in Alchemy, Septimus Piesse, who wrote a cornerstone book around 1860, called The Art of Perfumery, in which he had created something called the odophone, a chart where he laid out a scale with perfume notes (middle c was this, etc.) It was an interesting idea, I’m not sure I would agree with exactly how he mapped everything out, but I still find it a fascinating concept. I think what is important in that is the curiousity to explore these correlations and relationships, which is actually part of what makes someone a good creator. 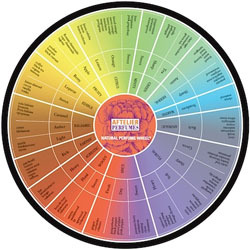 Yes, I actually have a natural perfume wheel on my website that correlates to the color wheel. I do a lot of work with wine makers, and I made it for my students. I find it is easier to first group smells together, and then try to study how they are different. It gives you a way to not be overwhelmed, so you can learn how to do blending. Could you speak a little about the different qualities one can look for when exploring perfumes? In perfume we arrange scents into categories called top notes, middle notes and base notes. When I work from my studio at home I sit in front of what is called a perfumer's organ, and I group the scents on the organ by how long they remain perceivable. This of course pertains specifically to natural perfume, because in the synthetic world they can manipulate things to last so they do not necessarily follow this arc. Top notes are usually pretty inexpensive, they last about half an hour to an hour, and they are often familiar from things like gardening. Mints, citruses, tarragon, things like that, which are often yellowish or clear in color if they are distilled. The middle notes last from two to about four hours, and they have a different texture. Where the top notes are more pointed and sharp, coming out to greet you as the opening note, the middle notes are warmer and rounder. Their smell has more layers, and if you put them on a piece of paper and smell it over time, things will lift off and reveal themselves. Common middle notes are rose and jasmine and nutmeg, and types of spices and florals. Base notes are the dark colored and heavy notes, essences that have been in man’s spiritual life since the beginning of time. They are things like frankincense and myrrh, oak moss, and the animal ingredients, very historical ones that speak to us on a deep instinctual level. So when you make a perfume, it unfolds over time, like music. Although the notes are not organized in a very structured way, when they lift off, the tops go first, then the middles, and so on. And they mingle with each other too, so in that way their unfoldment on your skin is a little bit like music. Listening to your descriptions, it sounds like the essences can act as a link between our personal experience and the natural world. Like how the base notes are derived from these deep things that have been around for so long on the earth, and have the longest staying power on our skin, and also invoke a sort of vague and ancient feeling within us that seems to stretch back to a very old memory in time. Yes, I feel like you can bring that awareness consciously or unconsciously to the experience of smelling perfume and working with the oils, or even cooking, and it simply enriches your life. It certainly has enriched mine. In addition to the essential oils and absolutes, you mention in your books the extraction techniques that have been developed to create what are called isolates. Could you explain a bit about what they are? Well there are natural and synthetic isolates. The natural isolates have been around since the late 1800’s, and are derived from essential oils and plants, and then there are ones that are synthetically made. So I use the ones that are natural– the simplest way to explain the process is that it is separating something out that is in the essence, like taking the yoke out of an egg. Essential oils are a cocktail of aroma chemicals, the natural materials of rose or jasmine or orange, and you can pull a strand out, and utilize just that strand of the material. They have a different kind of shape and texture, so you can add them to boost things, and can put a wing onto something that you are making. They are also used in the flavor industry. An isolate that has a very interesting history is natural violet. Violet is impossible to get, but there is an isolate called alpha–ionone that is very much like violet. Interestingly this isolate has the effect of putting your nose to sleep for a little while when you smell it. So when they originally isolated this ionone, they discovered its smell, and then they would lose it. Because of this, it took them a long time to even realize what this stuff was, and that it could be used in this way. Alpha–ionone is also found in things like black currant and blackberry, and black tea, and so on. My alpha–ionone comes from another essential oil that's called litsea cubeba. It's derived from the May Chang plant, a plant with a very wonderful lemon smell that comes from China. So working with alpha–ionone allows me to have this very interesting violet note. It's quite fascinating to think about the subtler qualities of the essences, such as these isolates. Are there any simple activities or exercises that people can do to cultivate an awareness of these subtleties? It's very interesting to smell an aroma over time. If you are interested in exploring an essence, you can buy these little paper strips called perfume blotters, or you can simply make them yourself out of watercolor paper. You can then dip one into what you are interested in, write down the time, and then smell it over time. You will notice that it will change, it will evolve and reveal different notes that are in the essence. You can also hold two next to each other and smell and compare them. It's a very simple thing to do, it's very educational and fun, and it wakes up your nose. It's generally known that there is a healing component in natural essences that does not exist in the synthetics. Do you ever consider the healing properties of essential oils when working with your perfumes? I do a lot, although I don’t talk that much about it. I talk more about the aesthetic aspect of it. I talk about the mood, the psychological piece of it, and not so much the other, because I feel like beauty itself is healing. I’ve seen this from the small classes I teach at my studio, which are pretty fascinating. I teach them a few times a year, and I see from the hundreds of people I’ve taught now, everyone’s use of language and experience is different. They often come to it struggling with the language and if you push things on them with how they should feel or how they should see each essence, which I think some people do, then they don’t find their way on their own. So when I’m in class teaching people how to create with essence, and I bring out an oil and discuss its capacities and talk about it, I am very careful to tell them that if my description of how it smells doesn't fit for them, then to go with theirs. Everyone needs to find their own true north of what things smell like to them, and not be told by anyone how they should smell, because their own intelligence will naturally calibrate to new material. So I give them a sign post, but not much. I noticed when I was teaching vintners for example that they were frustrated because I wouldn't tell them exactly what things smelled like. But I am a very firm believer that you should find your way on your own. So when someone finds what speaks to them, and they broaden their ability to perceive the beauty that is in this, I am very excited about the fact that it is good for you and wonderful and all that, but I leave people to get to that by themselves, and they do. I think that element of self discovery is so important. It is the same way in music– often the traditional way in which people are taught classical piano, for example, is that you are told what to play, and how to play it. And although it is of course important to be able to play your instrument well, not many people are encouraged to cultivate their own inner musical world, and trust their own intuition. Yet I feel this is where much of the creativity and joy of playing really comes from, and that in itself is healing, even to hear music played in that way is healing. When I make perfume, I always have music on, at a pretty deafening level. I find that where I go with music really informs what I do when I make a perfume. I don't feel like I’ve ever made anything without having some music on that was meaningful to me, and it changes all the time what it can be, but it's a very integral part of my creating. I feel many people today are wanting to create a life for themselves that's much more about this kind of exploration and discovery. They want to uncover a deeper world, rather than being given this big standardized thing from a corporate structure, or whatever it is. I feel this is a transition of cultural values we are slowly working through, from which we are reclaiming our senses and ourselves, one step at a time. And your work very clearly represents this phenomenon in the realm of scent. I try very hard to bring people into that through what I do. I love perfume, and particularly the part that is about beauty and aesthetics. I can always tell when I’m speaking with another person who shares this passion, whether they are making shoes, or cooking, or creating perfume. I can always tell when someone is sharing these values, and it's always a pleasure to me. Visit aftelier.com to learn more about Mandy and her unique line of natural fragrances and custom perfumes.